We would be happy to welcome you to this spacious and comfortable two bedroom flat in the centre of Kyrenia with easy access to restaurants, shops, local beaches and touristic sites. From the balcony and the roof-top terrace you will be able to enjoy a splendid view of the Kyrenia mountains and the Mediterranean sea - especially picturesque at sunset. Guests also have access to a roof-top swimming pool and the terrace area ideal for relaxing and catching some sun. 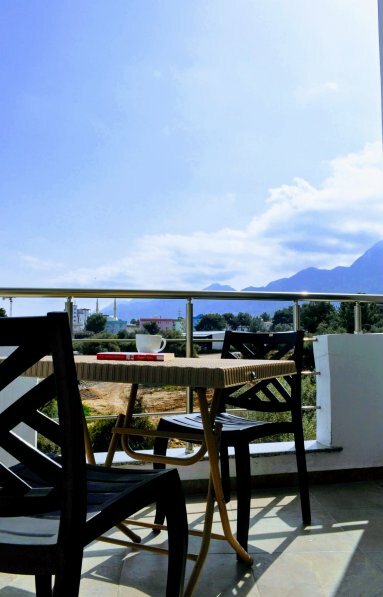 From the apartment guest can walk to the touristic port of Kyrenia in approximately 15 minutes, where they can enjoy a stroll along the port, stopping off at the seaside restaurants, cafes and pubs as they take in the scenery. Here you will also find the historical Kyrenia castle and a variety of shops, casinos and much more. Guests will have access to the entire flat including two bedrooms, one bathroom, a well-equipped kitchen, a large living room with a dining table and chairs and a balcony with outdoor table and chairs. A television and wifi is provided for guests' convenience. The flat is in walking distance to several small supermarkets, restaurants, cafes and bars. The apartment has at it's doorsteps a local Farmers' Market which runs on Wednesdays where guests can find traditional Cypriot foods such as home-made halloumi and olive oil as well as fruits and vegetables. If guests are travelling in large groups, the Host also has two studio flats in the same apartment block available. guests should note that the pool is not available in March and April.